This sordid form of servitude is experienced mainly by migrant low-skilled laborers trafficked into prosperous areas from poverty-stricken communities under the guise of paid labor. Victims find shortly after arrival that they cannot escape their working conditions without beatings and the threat of deportation or imprisonment. Experiencing physical and emotional abuse, they perceive themselves to be slaves or captives, as they often are. One day, the slaves from the orange grove began to run to a car on the side of the road belonging to Lucas, an opponent of involuntary servitude. 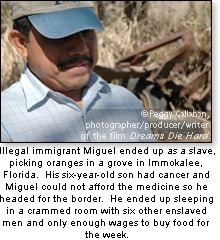 Miguel said it was because of Lucas' coalition that they were rescued and saved. The three Ramoses were sentenced to a total of 32 years in prison. The big companies they contracted for were never investigated. Miguel is legally working in a U.S. warehouse now, and sending money to pay for his son's medicine. Lucas continues to organize fellow workers at the “Coalition of Immokalee Workers” to fight slavery in Florida. Contract slavery: This is the most rapidly growing form of slavery, the second-largest today. Dr. Kevin Bales of FreeTheSlaves.net explained: “Contracts are offered that guarantee employment perhaps in a workshop or factory, but when the workers are taken to their place of work, they find themselves enslaved. The contract is used as an enticement to trick an individual into slavery as well as a way of making the slavery look legitimate, but the reality is that the “contract worker” is really a slave, threatened by violence, lacking any freedom of movement, and paid nothing.” Contract slavery is most often found in Southeast Asia, Brazil, some Arab States, and Indian subcontinent nations such as Thailand.